Thanksgiving is just around the corner and many Americans are looking forward to a feast. There will be tables laden with turkey, cranberry sauce, stuffing, gravy, sweet potatoes, yams, mashed potatoes, bread, salads, vegetables, and various pies. Sounds great, doesn’t it? What most people are not looking forward to is the sleepiness that follows the meal, which they blame the tryptophan in the turkey for. But is turkey really to blame? Tryptophan is an essential amino acid, which means that we have to get it from plant or animal sources because our bodies don’t naturally produce it. Tryptophan plays an important role in the production of serotonin, which leads to calmness and can make you sleepy. Tryptophan is also an important factor in the production of niacin, a B vitamin. And turkey contains tryptophan, which is why it has gotten a bad rap for making people tired. But other foods, such as chicken, egg whites, cheese, sunflower seeds, some fish, soybeans and pork chops have as much or more tryptophan as turkey and you don’t see people blaming those foods when they feel tired. Does eating turkey cause fatigue? Even though tryptophan is present in turkey, it is not the cause of the sedative effect that we feel after eating Thanksgiving dinner. In order for tryptophan to make you sleepy, you have to consume it on an empty stomach without consuming any other protein. Besides, the amount of turkey eaten during Thanksgiving is generally too small to have any appreciable effect. Scientists now believe that it is actually the eating of a heavy meal that is rich in carbohydrates that causes the tiredness, not the turkey. Of course, any alcohol that is consumed with the meal only adds to that effect. What can you do to be less tired? Don’t overeat: When you overeat, you will feel more lethargic because blood is diverted to your digestive system from other organ systems, making you fatigued. After all, it takes a lot of energy to digest a large meal. Limit carbohydrates: Meals that are heavy in carbohydrates trigger an insulin effect, making you tired. Limit fats: High fat foods take more energy to digest, requiring extra blood to be diverted to the digestive system, leaving less energy for other bodily functions, resulting in lower energy levels. Limit or avoid alcohol: Alcohol makes you more lethargic because it is a central nervous system depressant. The tryptophan in turkey has been blamed for causing the after dinner fatigue on Thanksgiving day, but the blame needs to be redirected to the true cause: overeating and too many carbohydrates and fats. So, if you don’t want to feel the overwhelming need to take a nap after the big meal this year, eat a more balanced meal that is not too high in carbohydrates or fats. And do not overeat or drink too much alcohol. If you follow this simple formula, you may make it through the Thanksgiving festivities without passing out on the couch after the meal. I always thought that it was the overeating that we do during the holiday season that makes us sleepy as well as tired.It was only some years back that I learned about the effect that turkey has in making you sleepy. Hi everyone, it’s Thanksgiving Day! I’m happy with my extra day off, and I am planning to make something fun that’ll probably involve a bike ride and seeing something new in Highland Springs I haven’t seen yet. The article in this link http://www.foodconsumer.org/newsite/6/Dining/it_s_not_your_turkey_s_fault_261120090933.html has 2 creditable sounding sides. One saying it’s proteins that trigger tryptophan and the other claims that proteins block it and it’s starches and sugar. This post is claiming that tryptophan and turkey really doesn’t matter. The only thing I truly know is that overeating does make me sleepy. 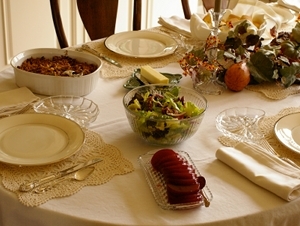 Many people including myself skip breakfast on Thanksgiving just to eat more at the dinner. Not so sure this is a bad thing, it’s it part of the tradition to sit around and rest after Thanksgiving dinner?